There are some things that are more fun than building an entire world, but not many. It is pretty tiring though. 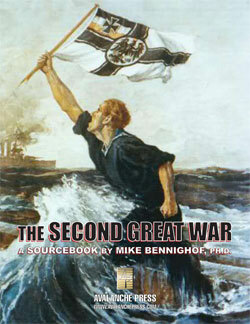 For The Second Great War, the background book for our Second Great War at Sea alternative-history game series, I wanted to do more than just toss out a proposition and build a game around it. My goal was to take one possible change to world events – acceptance of Woodrow Wilson’s December 1916 peace initiative – and explore its effects on politics, economics and social development. And on future wars too, since the book’s meant to support a line of wargames. August – September 1941: The Russians capture Warsaw. September 1941: Sea battle off Helsinki. September 1941: British-Dutch live-fire incident in English Channel. September 1941: The Russian Maritime Province is secured by the Japanese. September 1941: “Beef Convoy Beef” brings the Netherlands into the war on the side of the Central Powers. September 1941: The Russians capture Helsinki. September 1941: British Royal Marines land at Walvis Bay in German South-West Africa. September 1941: Austrian Caporetto offensive recaptures Trieste, destroys Italian First and Second Armies. September 1941: Daring Dutch destroyer attack on Scapa Flow sinks two battleships and two cruisers. September 1941: Anglo-Belgian offensive overruns Netherlands south of Maas River. October 1941: Heavy fighting as German colonial troops advance on Mombasa. October 1941: Russians occupy Georgia. October 1941: Turkish forces turn back Russian offensive at Edirne in European Turkey. November 1941: German armies push the Russians out of East Prussia. November 1941: Dutch Colonial troops land in northern Australia. November 1941: German and Australian naval squadrons battle in the Coral Sea. November 1941: Finland sues for peace. November 1941: British troops invade Kamerun. November 1941: Turkish fleet supports drive on Aden. November 1941: Naval battle off the coast of Uruguay. November-December 1941: French winter offensive widens hold on Rhineland at massive cost in casualties. December 1941: Organized resistance ends in Kamerun. The German West African Squadron steams to Brazil without loss. December 1941: British troops land in Sumatra. December 1941: The Japanese attack French Indo-China, landing troops at Haiphong and battling the French Far Eastern Fleet. December 1941: The British Tiger Convoy successfully crosses the Mediterranean Sea to Alexandria, Egypt. December 1941: Turkish forces capture Aden in southern Yemen. December 1941: Nairobi falls to the Germans. December 1941: Germany deploys new “super submarines” of great speed and stealth. December 1941: Naval battle off the German Baltic coast. January 1942: Russians capture Estonian islands of Saaremaa, Muhu and Hiiumaa. January 1942: Fast convoy brings artillery and other supplies to German East Africa. January 1942: Darwin and Broome in northern Australia fall to the Dutch. January 1942: A German-Dutch squadron devastates a large British troop convoy in the Bay of Bengal. January 1942: British and South African troops capture Windhoek, capital of German South-West Africa. January 1942: Argentine forces occupy Uruguay. January 1942: German squadron raids Rio de la Plata estuary. January 1942: Tsar Alexei orders killing of Polish, Ukrainian and Jewish prisoners, relents after threats of retaliation. February 1942: The Russian Pacific Squadron breaks out of Petropavlovsk, reaching French Indochina by way of Davao in March. February 1942: A major British assault on the Suez Canal fails. February 1942: Mombasa falls to the Germans. March 1942: Naval battles between the French and Japanese in the South China Sea. March 1942: Organized resistance ends in German South-West Africa. March 1942: British amphibious assault captures the German-held Faroe Islands. Naval battles result. March 1942: German Rhineland offensive fails to gain much ground. March 1942: Unrest in Hungary. Kaiser Karl dissolves Hungarian Diet and declares martial law. April 1942: British troops land in Iceland, beginning a lengthy land and naval campaign. April 1942: The British capture Sumatra. April 1942: Greek troops capture the Italian-held Dodecanese Islands. April 1942: German colonial troops occupy Kismayu and Mogadishu in Italian Somaliland. April – May 1942: German, Polish and Austrian mechanized forces re-gain Warsaw and much of eastern Poland and western Ukraine. April-May 1942: Major Iranian offensives fail to capture Basra. May 1942: Naval battle between British and Turkish-German squadrons in the northern Arabian Sea. May 1942: Renewed Russian offensive in European Turkey is turned back. May 1942: Turkish troops capture British-held Cyprus. May 1942: The Japanese begin a major offensive in Indochina. May – July 1942: French Rhineland offensive captures all German territory on the Rhine’s left bank except isolated bridgeheads in Alsace. June 1942: Turkish forces capture Pahlavi, the major Iranian port and naval base on the Caspian Sea. June 1942: High seas naval battle in the South Atlantic. June 1942: The British Eastern Fleet attacks the Japanese without a declaration of war and wins an overwhelming victory in the South China Sea, thanks to concentrated deployment of aircraft carriers with torpedo bombers. June 1942: Russian destroyer raid against the German coastline. July 1942: Major naval battle in the southern Baltic Sea. July 1942: The British capture Java from the Dutch. July 1942: In the so-called “Night of the Zeppelins,” a German-led airship invasion of Malta fails to conquer the island. July 1942: Austrians capture Kiev. July 1942: Reykjavik falls to the British. Germans abandon Iceland. July 1942: Brazilian offensive overruns most of Argentine-occupied Uruguay. August 1942: Austrians capture Odessa, interrupting Russian overland communications with Romania. August 1942: A large British convoy arrives safely in Alexandria, Egypt. August 1942: Major naval battle in the southern Baltic Sea. August 1942: Brutal house-to-house fighting in the last Alsatian cities held by Germany. August 1942: British attempts to turn back an American convoy bound for Norway result in a three-day series of surface battles. August 1942: The United States declares war on Britain, France, Italy and Russia. The United States and Japan officially ally with the Central Powers. Spain declares war on the Central Powers. You can order The Second Great War right here.